After spending some time with my family in Idaho, I’m back in Portland for a bit. You know Portland – the land of the super-yummy specialty restaurants. 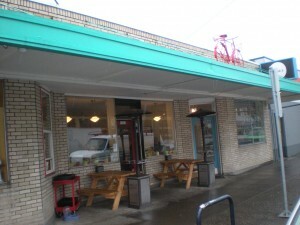 Now, I’d never heard of the Little Red Bike Café but, as it so happens, I do enjoy fried egg sandwiches. So, we made a course-correction and headed toward the smell of butter (always a safe option). The café is cute. Disguised as an unsophisticated walk-up counter kind of place, the café is anything but. The first clue to this was the tea menu. If a place has more than 10 types of tea on a special menu, it’s not unsophisticated. 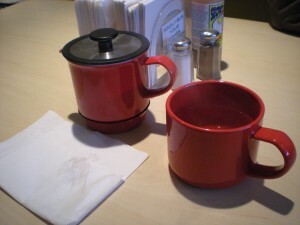 If the tea comes in a tea press, it’s bordering on fancy. We ordered a couple of sandwiches and sat down to talk about life. (Leo and I always have a good time conspiring to find fantastic business ideas and meaningful spiritual journeys.) But when they food arrived, I found myself totally distracted by the first bite. I got something called the “flat tire”. 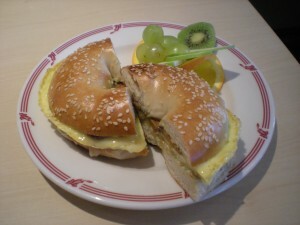 It had scrambled egg, cheese, aoli and veggie-bacon on a sesame bagel. Super-yum. When I ordered, I asked them to leave the bacon off. Forgetting I was back in Portland, I was surprised when the guy behind the counter offered me veggie-bacon. Yup, veggie-bacon. That just about made my day, not because I like bacon, but because I was reminded of the coolness of Portland. And, as the sandwich sat there, the aoli melted and coated the bread and egg. Leo got something else – something with real bacon. This bad-boy was serious. 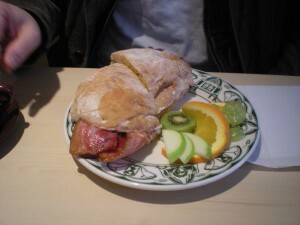 It had a fried egg, thick bacon and was on a ciabatta roll. I didn’t even ask how it was, I was so consumed with mine, but it looked tasty and disappeared quickly. 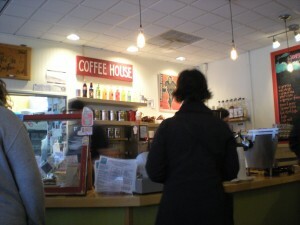 The staff was extra-helpful and Portland-funky. As I walked out, I looked back on the place and mused. Every-so-often I forget how cool Portland is. You don’t even have to look for incredible places to eat here. I’ve never even heard of a restaurant that specializes in fried-egg sandwiches, but now I know where to go next time I’m craving one. You forgot a tag . . . nummy!